In the mid Fall while everyone’s busy picking pumpkins, the senior Illustration students had begun the annual mural paintings outside of Fashion Institute of Technology. Our professor, Dan Shefelman, is the founder of this fun event few years ago. With the background of political science, I find Dan has some interesting angles to approach art. Plus this year we’re doing augmented reality for our finished painting. The theme for this year is – The Future is ... The Human Experience. Below are my initial black and white sketches. The robot dating app on the left is the silly side of me. I always like to create something highly relatable to everybody. Don’t try to deny, I know you’ve used some of dating app like Tinder before (or still now). Although the robots may not need to date other robots in the future, maybe we do? 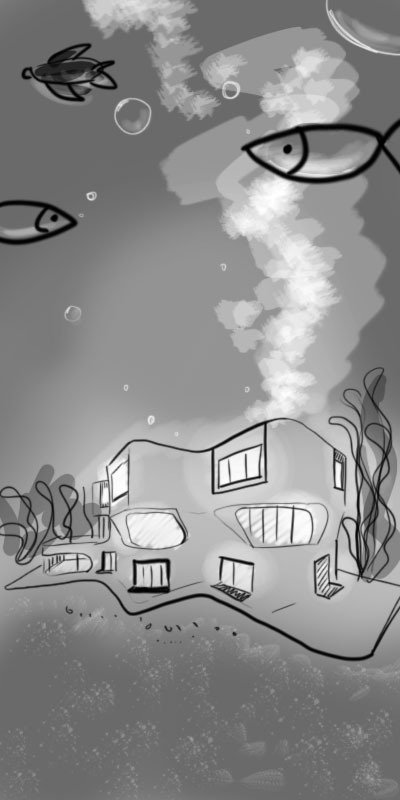 As for the sketch on the right, I envision future humans would be living under the water with the rise of sea level. Then here are the color sketches. I decided to go with the robot dating app in the end. Once refined the sketch, I began my mural painting. You see our idea is pretty fantastic right? And don’t worry, we did not vandalize your city building. The medium is pastel so it’s totally power-washable. For most of us, this is our first time doing large painting on limestone or concrete in public. It’s a positive experience. Finally it’s my short animation for augmented reality. To enable this feature while viewing the art work, the audience download the app Arilyn. Scan the art work and the animation will play on your phone. I strongly recommend you to try this feature when you stop by Fashion Institute of Technology as you can see different dimension of the works. The mural paintings are on the side of 7th ave and between 27th and 28th st. We are not sure if it’ll be kept till the end of December so I suggest to come check it out asap. Hope you enjoy this post and Happy Fall!